Miranda May Photos, News, and Videos | Just Jared Jr.
Miranda May knows a thing or two about being bullied. 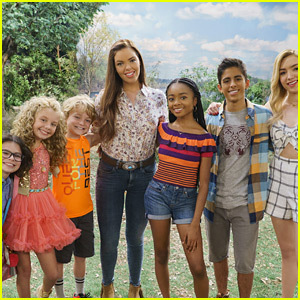 The Bunk’D star confided in fans that she used to get picked on for being different — especially about her fuller lips. Ronni Hawk absolutely slayed everyone on the 2017 Radio Disney Music Awards red carpet yesterday! The Stuck in the Middle actress wowed in a breathtaking red gown at the event, where she brought her brother Jared as her date. Kayla Maisonet and Miranda May were also at the show, along with Pretty Little Liars stars Janel Parrish, Keegan Allen and Kara Royster. K.C. Undercover‘s Veronica Dunne stepped out with longtime boyfriend Max Ehrich and co-star Trinitee Stokes. ABC stars Marsai Martin and Miles Brown were also there with host Alex Aiono. Don’t forget, the 2017 RDMAs air TODAY, Sunday, April 30th on Disney Channel @ 7PM ET/PT! Prom is such a great season and you’re bound to be looking at all the Disney Princesses for inspiration — but, let’s look outside the box. Bunk’D star Miranda May pulled inspiration for the annual dance from the most unlikely character ever — Jack Skellington! “Jack Skellington is just the character to take inspiration from,” Miranda says for a unique look for prom, or just a fancy night out.